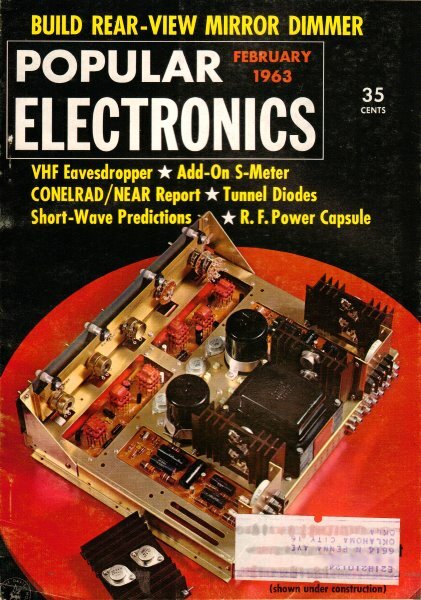 This Electronics Curves Quiz will probably prove to be a little more of a challenge than some of the ones previously appearing in Popular Electronics magazine. Being a rocket scientist won't help you much here, but being a seasoned electronics technician, hobbyist, or engineer will sure come in handy. Be careful to note the axis unit labels - I got tripped up by that from being lazy and missed one. 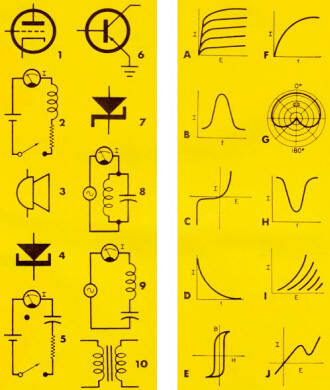 The operation of electronic devices and circuits is often represented by characteristic curves. 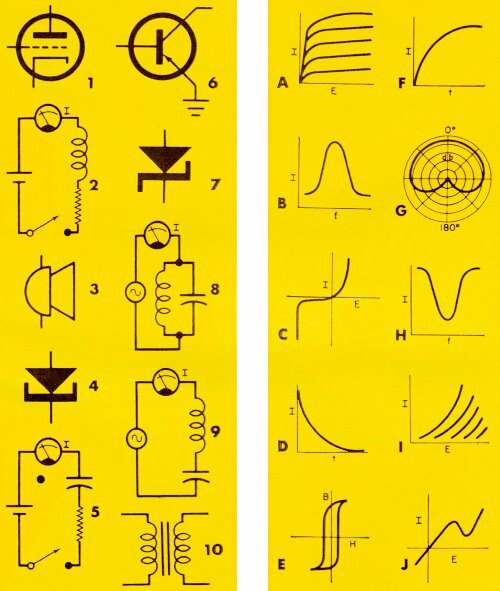 See if you can match the electronic devices and circuits at left (1 - 10) with their corresponding curves (A - J). 1 - I Triode vacuum-tube plate characteristic curves. 2 - F RL circuit current-growth curve. 3 - G Microphone unidirectional cardioid polar pattern. 4 - J Tunnel diode voltage-current characteristic curve. 5 - D RC circuit current-decay curve. 6 - A Transistor common-emitter characteristic curves. 7 - C Zener diode current-voltage characteristic curve. 8 - H Parallel LC circuit resonance curve. 9 - B Series LC circuit resonance curve. 10 - E Transformer core hysteresis loop.